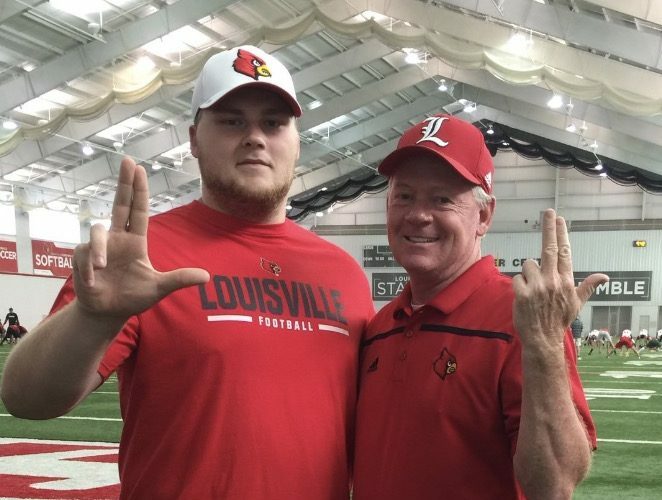 When Cole Bentley committed to Louisville it was big news for ‘Cards fans. 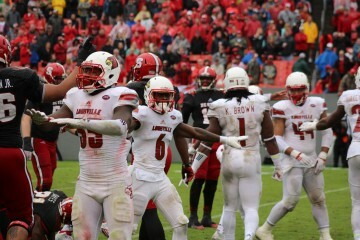 Typically, the big maulers “out in the state” wind up at Kentucky. Bentley is from Eastern Kentucky but he chose the ‘Cards however, because he believes the program is on the verge of something special and sees an opportunity to contribute early. Around the time he announced his decision to attend Louisville, some people coaimed Kentucky wasn’t pursuing Bentley very hard and that he “settled for Louisville.” Bentley was quick to dispel that rumor when I asked him about it. Bentley also shot down the assumption he grew up a fan of the Wildcats. Bentley started playing football as a Marshall fan back in third grade as a linebacker in Pee Wee ball. He now plays TE in a run dominant Wing T system for Belfry High as well as defensive tackle on the other side of the ball. While Bentley plays tight end, he is used primarily as an extra edge blocker in Belfrey’s attack but he projects as an interior lineman in college. The thing that stands when watching his tape is how he drives his defender all over the field or to the ground until the whistle blows. He’s up to 315-pounds and his athleticism combined with his unrelenting motor should have Louisville fans and running backs excited for the future. Bentley will conclude his high school football career this Saturday when the Pirates take on the Central Yellowjackets in the 3A Kentucky state chanpioship. If Belfry wins it will be their fourth straight 3A state title and Bentley will not know what it’s like to not win state as a player. Also, his days in high school will end shortly thereafter the season wraps up. The talented offensive line prospect will enroll early at UofL on January 6th as an early enrollee.